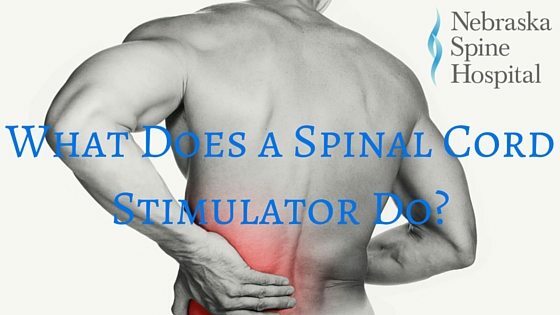 What Does A Spinal Cord Stimulator Do? How Do Spinal Cord Stimulators Work? Back pain can be difficult to live with and there are times when something is needed to help with the pain. A spinal cord stimulator may the answer when other avenues no longer work, or it may be needed in conjunction with other procedures as well. A spinal stimulator is a device that is placed directly over the spinal cord that blocks the electrical impulse that the brain interprets as pain from reaching its destination. It is put in place through a surgical procedure during which the patient is often awake. It exerts pulsed electrical signals. It sends these signals to the spinal cord and is used to control chronic pain. It does this through implanted electrodes and an electrical pulse generator. There is also a generator remote control. Once implanted this device emits pulses that interfere with the impulses from your nerves that make you feel pain. If the impulse cannot get to your nerves there is no pain. There are many reasons people choose to have a spinal stimulator implanted and severe, chronic pain is always a factor. Failed back surgery syndrome is one reason. Back surgery can be risky and doesn’t always succeed as hoped. Nerve related pain or numbness that is severe is another reason for the procedure. Patients with complex regional pain syndrome, or other chronic pain syndromes, may opt for a spinal cord stimulator as a way of dealing with the pain. There are other conditions where a spinal cord stimulator may be used as well although it may be considered experimental for some of them. These can include paraplegia, multiple sclerosis and things like intractable angina. The answer is both yes and no. In certain situations and people it can work wonders. The general percentage reported by researchers indicates that it helps in about 50% of those who have it done. Failed back surgery syndrome, chronic low back pain and complex regional pain syndrome seem to be conditions that it helps. One of the downsides can be that over time, as the body adjusts to the treatment, it becomes less effective. Scar tissue development around the electrodes. As with any procedure you need to talk to your doctor to determine what your options are and what the benefits and risks are for your situation. Not every procedure is the right choice for everyone.